Donald J. Trump was elected president of the United States in 2016 and inaugurated on January 20, 2017. He holds the highest office in the land, and for most scholars, he is the “leader of the free world” as long as the United States holds the status of the last remaining superpower. His campaign for the GOP nomination and ultimately, the presidency, was highly contentious, and according to many in the media, highly divisive. His nine months in office have been controversial, to say the least, as he appears to break every political norm or convention previously ascribed to our nation’s highest office. To his supporters, that’s why he was elected: he appealed to large sectors of the electorate who felt alienated and forgotten by the government and the economy, portraying himself as an outsider willing to use business-related methods to “drain the swamp” and change the institutions of the federal government in Washington, DC. To his rivals and detractors, the president has engaged in activities that at best have been unbecoming of the highest office, and at worst, constitute what Article II of the Constitution calls, “high crimes and misdemeanors.” In fact, Democratic members of Congress have called for his impeachment as numerous congressional and independent investigations look into possible collusion with the Russian government during the 2016 election and possible obstruction of justice allegations in the wake of the election. The presidency is a central element in our nation’s secondary school curriculum. Teachers in this field are faced with a difficult task: how to teach about the Trump presidency while maintaining the appearance of objectivity and impartiality. Educational practices have long supported the idea of critical thinking. Since 1948, teachers in all subjects have subscribed to a paradigm called Bloom’s taxonomy, originated by psychologist Benjamin Bloom, who theorized that there are levels of learning that increases in its complexity of thinking. According to Bloom, in its most simple form, learning consists of remembering and understanding. As teachers challenge students to think critically, students must graduate to application and synthesis of new information, and then teachers must lead their students to evaluate content and create something new as a result of their learning. (Coffey, Heather, Learn NC, Blooms Taxonomy, available, 2017). In civics education, teachers use Bloom’s taxonomy to teach about the democratic principles embedded in the Constitution, the separation of powers and checks and balances system within the three branches of government, and the democratic process of electing leaders at all levels of government. Teachers of secondary social studies, especially in Civics and government classes, have an obligation to their students to discuss current events and help students evaluate those events in the context of history by using these critical thinking skills. The challenge today is that the candidacy and presidency of Donald Trump have often run contrary to beliefs, norms, and actions that are integral to the social studies curriculum. If teachers treat his role in politics objectively, they must be able to allow students to critique his actions as candidate and president, in both positive and negative terms. Unfortunately, teachers who help students take a critical view of Trump’s actions are accused of trying to inject a liberal bias into their teaching. Such teachers are then reported to administrators as failing to teach objectively as they are perceived as attempting to turn students against the president. On the other hand, if a teacher points out President Trump’s strengths or planks within his platform with which the teacher might agree, the teacher could also open him or herself up to criticism that he or she was attempting to indoctrinate the students to become supporters of the president. Either way, this type of situation must be avoided so that students are free to arrive at their own conclusion about the presidency, as well as this president’s role in American domestic and foreign affairs. As I write from experience, there is no easy way to teach young people about Donald Trump, or his actions. Or his policies without making someone angry, usually a parent, which in turn, leaves teachers on the defensive and students confused about what is true in American politics and where their loyalties should lie in and out of the classroom. The conflict in the classroom about our current chief executive has real-world consequences for educators. During the campaign and transition, teachers discussed the actions and beliefs of then President-elect Donald Trump. One forty year history teacher, Frank Navarro of California, was placed on administrative leave for comparing the Trump agenda to that of Adolph Hitler. Navarro was eventually vindicated in his lesson because in his words, “Everything I talk about is factually based. They can go and check it out. It’s not propaganda or bias if it’s based on hard facts.” In his mind, Navarro was allowing his students to come to their own conclusions about the newly elected chief executive. (Rosenmann, Alexandra, “Holocaust Scholar Suspended from Teaching Job for Comparing Trump to Hitler.”, available, 2016). Navarro was accused of saying critical things about President Trump that he never said. After the incident was resolved and Navarro was allowed to resume teaching, he decided to retire. If teachers are not able to criticize the actions of the president without fear of reprisal, how can they teach the curriculum effectively? The Civics curriculum includes such concepts as rule of law, separation of powers, the Fourteenth Amendment’s call for equal protection under the law, and the government’s obligation to provide due process of law. A look at the first nine months of the Trump presidency brings some of these ideas into focus. The travel ban instituted by the President was twice struck down in federal court as being discriminatory against immigrants and refugees from Muslim-majority nations. The president has frequently tweeted assertions that have been shown to be demonstrably false such as the claim that President Obama used surveillance against the Trump campaign or that millions of illegal aliens voted in the 2016 election. Finally, the President’s firing of FBI director Jim Comey as an example of possible obstruction of justice is reminiscent of the Saturday Night Massacre of the Watergate Scandal, bringing down the administration of then-President Richard Nixon. Teachers of Civics and History have a duty to point out these parallels, as Navarro did, but they open themselves up to career-ending accusations from parents and organizations that have their own bias and agenda to fulfill. Shortly after the election of Donald Trump, Professor Jonathan Zimmerman wrote in a Charlotte Observer op-ed, “The question, again, is not whether Trump is good, bad or indifferent. It’s whether we will have the courage to leave the answer up to students, instead of imposing our beliefs on them”. 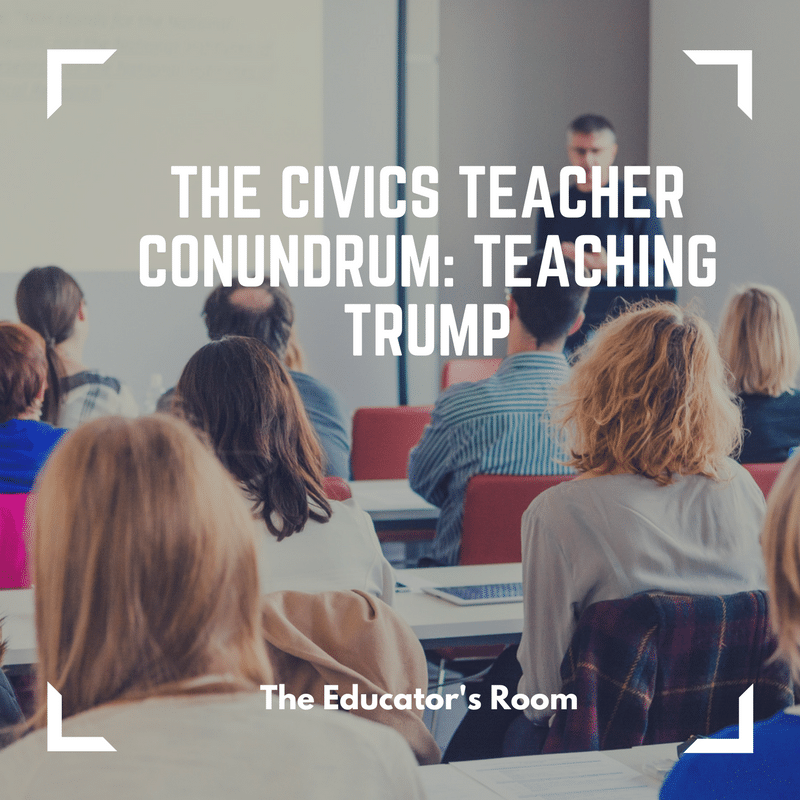 While Zimmerman’s point holds true for most instances of Civics education, the Trump presidency stands counter to many traditional aspects of American politics. Calling Mexican immigrants “rapists and murders,” failing to call out white supremacists in a deadly act of violence in Charlottesville, threatening North Korea with the possibility of nuclear war, and the many reversals of policy that were contrary to his campaign promises, among many other actions, all lead students to demand answers from their teachers they may be unwilling to give. It’s not that they are against the president, but they may be perceived as being so because the Trump presidency itself runs counter to values and concepts long cherished by Americans on both sides of the political divide.